Designs can be found anywhere; get inspired by fashion magazines and the prints that are trendy right now. Craft and needlework stores have books, magazines and kits as well as stitched models for viewing. Design sites and blogs are available online and many have copy free patterns that can be downloaded at no cost. Check out contemporary embroidery books that are on the market right now, there are a lot out there and contain great patterns that are quick to stitch up. Once you’ve selected a design for your project, the next step is to choose the colours. The easiest way to explore the possibilities is to make several photocopies of the design and colour them in. Once you’re settled on the colour palette, consider the threads and the stitches you want to use. Think about how you want the design to look; smooth, textured, filled in with a pattern or outlined and open. 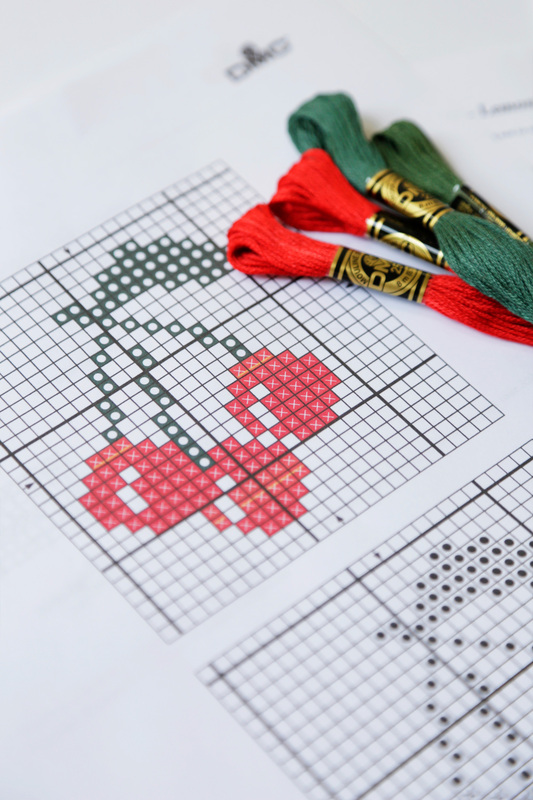 Review the embroidery stitches located in the Stitch Guide section, the types of threads you want to use and try to visualize the possibilities. 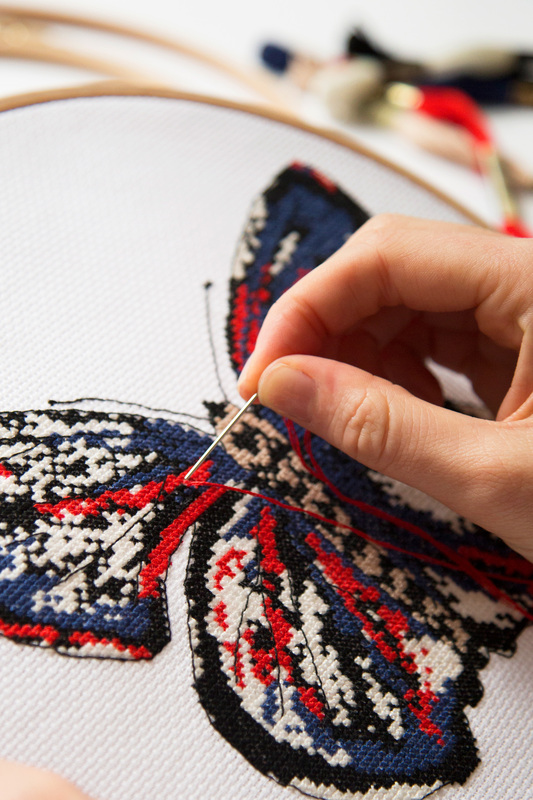 Don’t hesitate to try out a stitch or two; you can always remove them and start over again. There are many different types of fabrics and each has its own particular characteristic. When selecting a fabric you need to consider the embroidery techniques you’ll be using and the type of threads you’ll be stitching with. There are three basic kinds of fabric used for embroidery. Woven Fabrics have a smooth tightly woven surface and are commonly used in clothing and home goods. These items are perfect for embroidery projects, because there is no finishing required! Even-weave Fabrics are distinguished by their distinct evenly spaced threads and are traditionally used for counted thread techniques like cross stitch, lettering and pattern embroideries. Fabricated Fabrics are firm and non-fraying. Made by matting fibres together to form felt and suede materials, it’s a popular fabric valued for its soft feel and embroidery ease. All three fabric types are manufactured in natural and synthetic fibres, various weights and available in a rainbow of colours. Cotton, linen, felt, whatever you chose there’s a fabric match for your project. Once you’ve selected a fabric, try embroidering several stitches so you can determine if you’ve chosen the right threads. A threaded needle should easily go into the fabric and the embroideries lie flat without puckering the surface. If the design and threads are hard to see, you may want to increase the number of thread strands or choose a thicker thread. If the thread overwhelms the fabric or distorts the design it may be too thick and a lighter one may be preferable. Tip: When choosing threads and fabrics make sure they are of similar weight. Delicate threads for light fabrics and thicker ones for heavier fabrics. Surface embroidery will entice you to stitch with a variety of threads and fibres. Choosing the thread that best suits your project is part of the creative process and often depends on the fabric you will be stitching on and the depth and texture you’re looking for in your embroidery. Whatever you choose, DMC has a thread for you. The DMC range of threads and specialty fibres has the perfect one for your project- colourful twisted Pearl Cottons, overdyes, Light Effects threads, glow in the darks, shimmering Satin thread and more. All DMC threads are made from the highest quality materials and are 100% colour fast and fade resistant. DMC Mouline Stranded Cotton Thread is one of the most versatile threads for embroidery. It is comprised of 6 easily separated strands, allowing you to adjust the thickness of your stitching by using a different number of strands. Charts and instructions commonly refer to a strand as a ply (i.e. 6 ply embroidery thread). Mouline Stranded Cotton Thread is a soft thread made from long staple Egyptian cotton and mercerised to give it a beautiful lustrous sheen. DMC Mouline Stranded Cotton Thread is available in over 450 solid colours. DMC Pearl Cotton is easy to work with and appropriate for using on a wide variety of fabrics and all types of embroidery. DMC Pearl Cotton is a finely twisted non-divisible thread that has a supple silky feel that gives your embroidery a shiny raised texture and lustrous finish. DMC Pearl Cotton is available in four sizes 3, 5, 8 and 12. Size 3 is the thickest and size 12 is the finest. Pearl Cotton Skeins come in size 3 and 5 in over 250 colours, and Pearl Cotton Balls come in sizes 5, 8, and 12. Pearl Cotton size 5 is the most popular and commonly used size for embroidery. DMC Color Variations are a collection of “overdyed” threads that are beautifully designed to create subtle variations in colour without having to change threads. Each skein has a blend of soft multi-colours that flow seamlessly into one another along the length of the thread. Color Variations are available in a distinct blend of colours in both 6-strand Mouline Stranded Cotton Thread and Pearl Cotton Size 5. DMC Light Effects are created to add light and reflective qualities to your design. These 6-strand glistening threads are the perfect specialty thread for highlights and decorative sparkles. Available in a diverse assortment of colours to compliment any embroidery, Light Effects come in these distinct colour groups: Precious Metals, Jewels, Antiques, Pearlescents, Fluorescents and Glow-in-the-Dark. DMC Satin Thread is a silky 6-strand thread that adds exceptional beauty and sheen to embroidery. These lustrous threads glide easily through fabrics and come in a vibrant range of colours created to inspire. Use Satin Thread to embroider entire designs or to accent areas where you want a notable glossy shine. Needles come in various sizes, lengths, shaft thickness, eye shapes and are either pointed or blunt tipped. Needles are sized by number and the bigger the number, the smaller or finer the needle. In general, select a needle that opens up a large enough hole in the fabric to allow the thread easily pass through. Refer to the DMC Needle Guide to see which needles are best for the thread being used. For most of your embroidery projects you will be using DMC Embroidery Needles or DMC Chenille Needles. DMC Embroidery Needles have a long eye for easy threading, and a very sharp point which will pierce close-woven fabrics. DMC Chenille Needles are also sharp pointed and long-eyed, but run only in the upper size range like the DMC Tapestry Needles so they are ideal to use with thicker threads. TIP: White chalk pencil lines can be accidentally removed when stitching. Take care to avoid rubbing or placing your hand on the design areas until the embroidery is completed. Click here to see different ways to transfer your design. 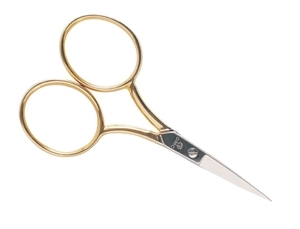 choose from any one of DMC’s premium steel Italian embroidery scissors for cutting your threads and fine detail work. It is also a good idea to pick up a pair of fabric scissors, found at your local craft store, to cut the pieces of fabric for your projects. Remember to only use your scissors for cutting fabric and threads! Cutting paper or cardboard will ruin them in a hurry. The DMC Colour Card is a wonderful reference tool to have on hand when searching for a special colour. 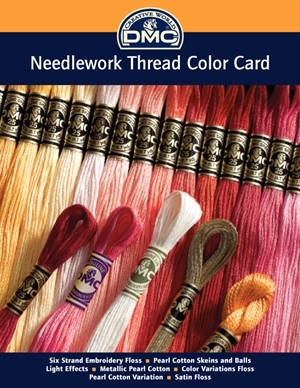 It allows you to view the entire thread colour range and compare the subtle shades of each colour available in the DMC thread range With the DMC colour card you can choose your own colour palettes to personalise any cross stitch design or find a substitute shade should your shop be out of a colour. 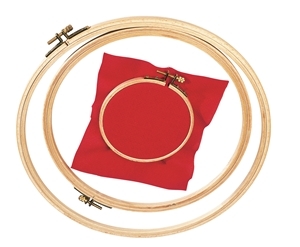 Embroidery Hoops help keep the fabric taut and your stitches even. Round hoops are the most common shape available and generally range in size from 3” to 12”. They’re made from either plastic or wood and come in various styles and screw locking systems. Select a hoop that is slightly larger than the design area. The fabric should extend about 2” beyond the edges of the hoop to allow you to position and secure the fabric properly.